Leaked audio recording of Bradley Manning describing his response to the July 12, 2007 Baghdad Apache airstrike video that documented the killing of two Reuters journalists. www.democracynow.org – A leaked audio recording has emerged of the statement Army whistleblower Bradley Manning delivered at his pre-trial hearing in military court late last month. Manning acknowledged he gave hundreds of thousands of classified documents to WikiLeaks, saying he wanted to show the American public the “true costs of war” and “spark a domestic debate on the role of the military and our foreign policy in general as it related to Iraq and Afghanistan.” This is the first time Manning’s voice has been heard publicly since he was arrested nearly three years ago. We air excerpts of his remarks, hearing Manning describe in his own voice the moment he decided to release the documents, and the outrage he felt at the “Collateral Murder” video of an Apache helicopter attack in Iraq. He’s seen by many as one of the world’s most renowned whistleblowers, but an enemy of the state by the US government. Now soldier Bradley Manning can be heard in his own voice explaining why he sent hundreds of thousands of classified documents to Wikileaks in 2010. In a new leaked audio recording from his court martial, Manning accuses the American army of not valuing human life, and says he wanted to provoke a debate about US foreign policy. This entry was posted in All Posts News Politics and-or Videos, Dandelion Salad Videos, Justice or Injustice, Politics and tagged 1917 Espionage Act, Collateral Murder, Daniel Ellsberg, Ellsberg-Daniel, Meet the new boss the same as the old boss, Michael Ratner, Pentagon Papers, Ratner-Michael, Whistleblowing. Bookmark the permalink. Excellent and thank you for permitting Amy Goodman to request support of her absolutely EXCELLENT DemocracyNOW program. Thank you for all of these videos and the excellence of Dandelion Salad information for the entire world. 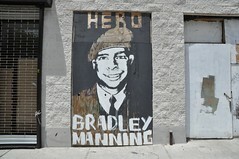 Bless Bradley Manning. I hope soon Bradley will be set free for the good he has done for truth and knowledge.